Heat coals or gas grill for direct heat. Cut four 18x12-inch pieces of heavy-duty foil. In small bowl, mix cheese, lemon peel and oregano. 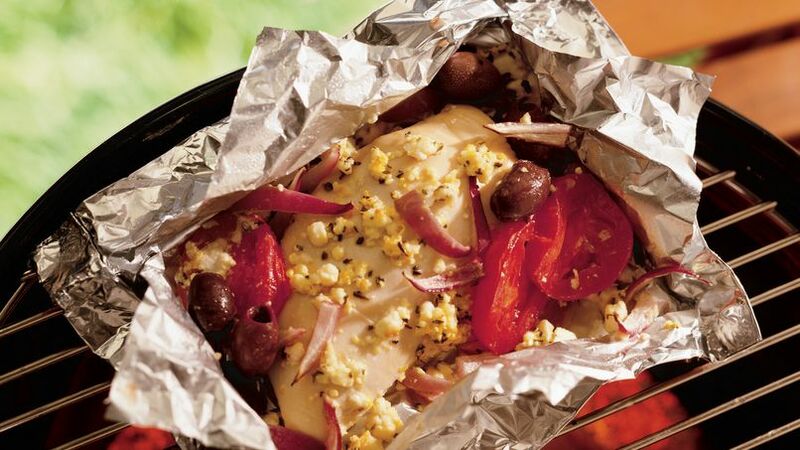 On one side of each foil piece, place 1 chicken breast half, 3 tomato slices, 1/4 cup onion and 5 olives. Spoon one-fourth of cheese mixture over chicken and vegetables on each foil piece. Cover and grill packets over medium heat 20 to 25 minutes, rotating packets 1/2 turn after 10 minutes, until juice of chicken is no longer pink when centers of thickest pieces are cut. While packets are being grilled, cook rice in water, according to package directions, omitting salt. Place packets on plates. Cut large X across top of each packet; fold back foil. Serve chicken with rice. You can use a package of crumbled plain feta cheese instead of the flavored feta. Treat your family with Mediterranean dinner! Serve tasty grilled chicken and veggies packets with rice.